Ancient Greek legends told of a fabulously wealthy land where Jason and the Argonauts stole the Golden Fleece from King Aeetes with the help of his daughter Medea. It was a distant land that was reached by the Black Sea and down the River Phasis. The actual site of this legendary kingdom has never been found but the Greeks must have been greatly impressed by the Colchis region of Georgia, through which the River Phasis (currently the Rioni River) runs, for such stories to have been born. Geographically, ancient Colchis comprised the land bounded by the Black Sea to the west, the Caucasus Mountains to the north, the Surami Range to the east and the Meskhetian Mountains to the south. In this fertile, sheltered area, Colchian civilization flourished. Their Late Bronze Age (15th to 8th Century BC) saw the development of an expertise in the smelting and casting of metals that began long before this skill was mastered in Europe. Sophisticated farming implements were made and fertile, well-watered lowlands blessed with a mild climate promoted the growth of progressive agricultural techniques. It is likely that the Golden Fleece existed. Earlier in this century, remote mountain villagers in Svaneti (a part of ancient Colchis) were observed using sheepskins to trap the fine gold particles in the rivers that flowed from the Caucasus Mountains. The skins would then be dried and beaten to shake out their contents. However, it is debatable as to whether or not the legendary 'wealth' of Colchis referred only to gold. Archaeological evidence dates the earliest Greek imports of painted pottery and amphorae to the end of the 7th Century BC. In exchange, it is thought that Greeks sought the rich natural resources of Colchis including wood and metal ores as well as textiles. The Ancient Greek writer, Herodotus, referred to the superior quality of Colchian linen and today, the mountain slopes remain heavily forested. The site of an ancient temple city, Vani is a city in the Colchis Lowlands located on the western bank of the Sulori River at its confluence with the Rioni River (River Phasis in ancient times). It is best known for the extensive archaeological excavations that have taken place there during the past 100 years. Although only a third of the site has been studied, it has produced an astonishing number of artifacts: Colchian pottery, exquisite golden jewelry unique to Colchis, imported Greek luxury items, graceful bronze sculptures and a vast array of funerary pieces. Its location is on a hill bordered by two ravines and overlooks the plains through which the Rioni River flows. There are beguiling views of the Sulori River Valley with its surrounding hills and the Meskhetian Mountain Range in the background. It is not surprising, therefore, that Ancient Colchians chose this beautiful and strategic location as the political, economic and spiritual center of their community. The name of this ancient city is still unknown but four distinct stages of uninterrupted occupation have been identified. Artifacts (mainly Colchian pottery) of the first stage, 8th to early 6th Century BC, are relatively few and badly damaged. A sacrificial area was found with clay animal offerings suggesting some importance of Vani over the adjoining areas which yielded no similar findings. The second stage, early 6th to mid 4th Century BC, reveals many changes. An abundance of artifacts are found including imported Greek painted pottery and new types of pottery for the storage or transportation of cereals, oil and honey as well as the fermentation and storage of wine. Rich burial sites with large quantities of golden jewelry, silver and bronze adornments, pottery and luxury items befitting the status of the deceased indicate that the ruling elite were buried here while poorer graves were found only in the surrounding areas. The site seems to have been dominated by a local aristocracy with a socially stratified, urbanized society. The Early Hellenistic Period of the mid 4th to the mid 3rd Century BC gave rise to a more marked Greek influence. Stone structures are utilized for the first time and many elements of Greek architecture are used. There is evidence of Greek customs being imitated in their burials and Greek innovations in gold fabrication techniques are observed. However, roof tiles, pottery and coins from Sinop as well as Cappadocian influences on signet rings and other glyptic items indicate an expansion of commercial activity with other areas and coincides with the decline of Attic imports in the Black Sea trade. The fourth stage is the Late Hellenistic era from the mid 3rd to the mid 1st Century BC when the ancient city was destroyed. In this period, many temples and altars were constructed and enclosed by thick, defensive walls. Buildings were richly decorated with figured capitals, friezes and bronze statues that were probably produced by visiting Greek masters. There is evidence that this city was destroyed twice, the second being the final after which time only limited occupation occurred throughout the subsequent centuries. 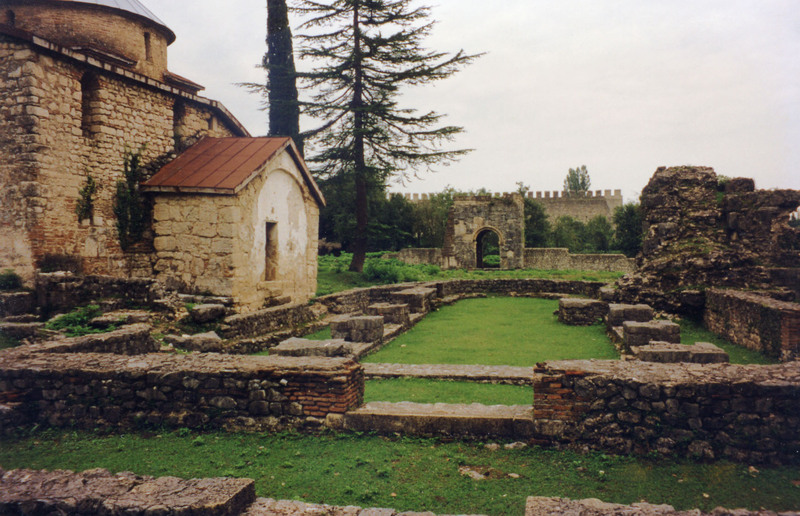 Today, archaeological excavations continue with the hope of understanding more of Georgian history and the influences of Ancient Greek colonization of the Black Sea area. An archaeological field school at Vani allows you to participate in this modern day quest for such an understanding and perhaps the solutions to the many questions that remain unanswered regarding the legendary kingdom of King Aeetes as described in the stories of Jason and the Argonauts! About 40 Km to the East of Vani along the Rioni River is Kutaisi, Georgia's second largest city and the most ancient city in the Kingdom of Colchis. It has retained many traits of a medieval town with massive fortress walls and the magnificent 11th Century Church of King Bagrat. The view from atop the old defensive walls behind the church is superb. The Rioni River emerges from the Racha Mountains to meander through the Colchis Lowlands while the Gelati Monastery sits in isolated splendor on a mountain across the river. It was built in the 12th Century by King David the Builder who also founded the adjacent Gelati Academy, an important school of philosophy, where you can still see the stone benches of the students and the Master's seat. King David consolidated Eastern and Western Georgia and his grave is here at the entry gate. Near to Kutaisi, the Motsameta (Two Martyrs) Church nestles high on a cliff overlooking the Tskhaltsitela Gorge at a bend in the river. It commands a sweeping panorama of the gorge as well as the rocky escarpment of the facing cliffs. There are trails on both sides of the promontory that lead down to the river. On a hot, summer day, the river is too shallow for a swim but the cool, clear water is refreshing to splash in. Northwest of Vani is the village of Nokalakevi, known to the Greeks of the 6th Century AD as Archaeopolis. It was the main city of Western Georgia from the 4th to the 8th Century AD and the residence of the kings at that time. A part of the massive defensive walls has been reconstructed and remains of the original walls can be seen running up the mountain and along the cliffs that border the Tekhuri River. Excavations revealed a secret gate that was accessed by a tunnel running down to the river at the western end of the city. In 737-738, the city was destroyed by the Arab general, Mervan ibn-Muhammad, known to Georgians as Mervan the Deaf because he was so oblivious to their pleas for mercy in his rampage throughout Georgia. May to September. Currently, cooler months cannot be recommended due to difficult economic conditions in Georgia whereby electricity is intermittently available. Direct air connections to Tbilisi are available from Amsterdam, Athens, Berlin, Frankfurt, Istanbul, London, Moscow, Paris, Prague and Vienna. Airlines flying to Tbilisi are: British Airways, Turkish Airlines, Austrian Airlines, Aeroflot, Air Ukraine and the national Airline, Airzena Georgian Airlines. Bus service is available between Istanbul and Tbilisi but this is a lengthy trip that may exceed 40 hours depending on the border formalities. There are connections between Trabzon, Turkey and Batumi, Georgia so consider breaking up the trip with a day or two in Trabzon. International rail service is not currently available to Tbilisi or Batumi. International ferry service from Trabzon to Batumi has been discontinued. Days are often warm but can also be quite cool while evenings are usually cool. Bring a sweater and a light waterproof jacket with hood. Good walking shoes are essential. Shorts and tank tops are inappropriate for visiting Georgian monasteries and churches. Be sure to bring all the personal toiletries and prescription drugs that you may need as these are not available. Those participating in the archaeological excavation should bring comfortable clothing and shoes. You will also need a flashlight, plastic sandals (for the shower), a book for rainy days, pens, pencils and paper, and Kleenex. If you have the space, favorite snacks such as dried fruits, nuts and energy bars are treats that can be shared with local children. Visas are required of all foreign nationals. These may be obtained from your nearest Georgian Embassy or Consulate. Georgian Embassies or Consulates are currently located in the following cities: Ankara, Athens, Bonn, Brussels, London, Moscow, Paris, Rome, Vienna and Washington DC. There is also a Consulate in Trabzon, Turkey for those who want to cross the border at Sarpi (Mr. Giorgi Janjgava, #20, Gazi Fasha Cadesi, Trabzon, Turkey. Tel: 90-462-326-2226, Fax: 90-462-326-2296). This is an administrative office so only limited information about travel within Georgia is available. Visas are issued here for $70. The Tourist Information Office in Trabzon also has no travel information but they will direct you to the Georgian Consulate as well as the ticket office for the appropriate bus. Current economic conditions make it difficult to travel independently in Georgia because there is no tourist infrastructure. Many former hotels are filled with Georgian refugees from surrounding areas of conflict. In Tbilisi, there is only one hotel, the Sheraton Metechi Palace Hotel, that meets Western standards. Small hotels and private pensions exist but they are not well advertised and rates are high relative to comparable Western facilities. Unless you speak Georgian or Russian, traveling throughout Georgia is challenging at best. Buses are irregular and restaurants and hotels are non-existent in the small towns. All visits to Georgia should start in the capital of Tbilisi where it is more likely that you will be able to find someone who can help you to make the necessary arrangements for visiting the outlying areas of the country. 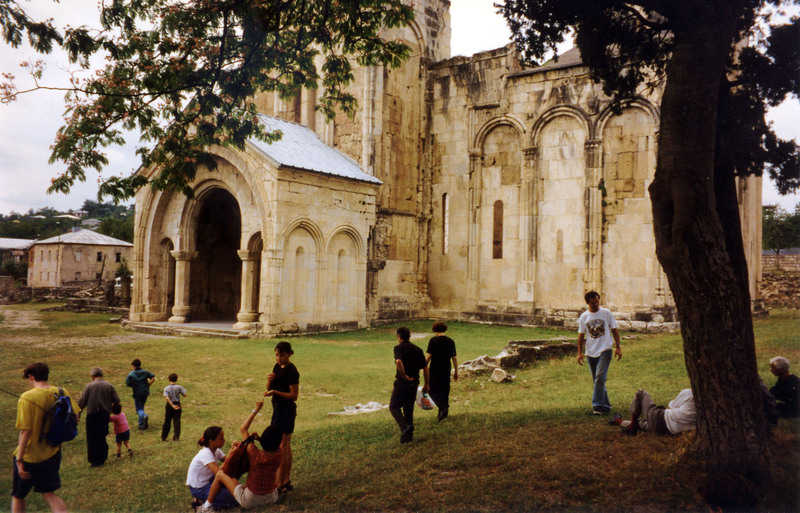 The easiest way to visit Georgia is with a group sponsored by a local organization. They will make all arrangements for your stay and will usually provide visits to Georgia's more important places of interest. It is possible to travel semi-independently if you hire a personal guide who will act as a translator, make arrangements for lodging, food and transportation, and help you with your itinerary. It is the lack of a tourist infrastructure that makes a visit to Georgia such a fascinating and adventurous experience. 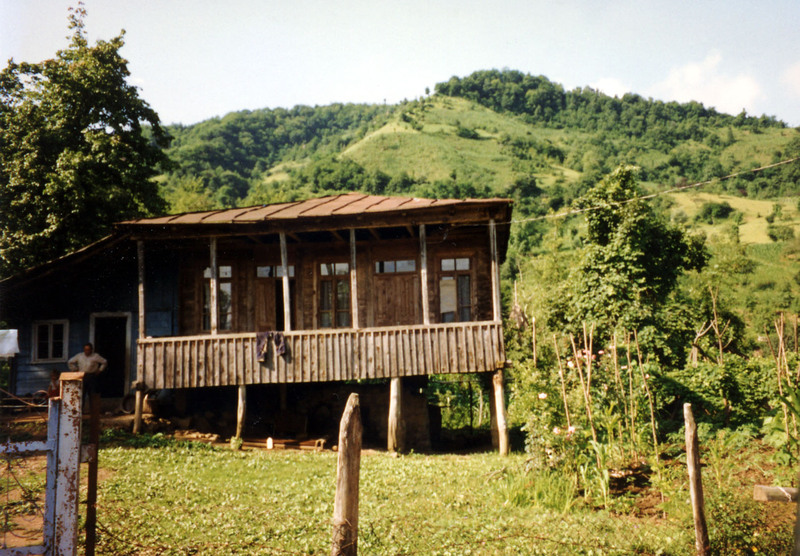 It forces an intimacy with her people and their culture and unlike many other travel destinations, one is required to live as local Georgians do. In spite of the many challenges involved, a visit to Georgia is an unforgettable experience that gives you the opportunity to discover the essence of a people that is often hidden when tourism is promoted in traditional ways. Acquaint yourself with the history and geography of Georgia before you leave home. It will promote a better understanding of Georgians who claim to belong to one of the oldest races of the world. Accept the advice of Georgians relative to safe travel in their country. Changes in the former Soviet Republics occur so rapidly that no guide book can stay current with local events. There is a very limited tourist infrastructure in Georgia. Any visit to Georgia should be considered "roughing it." There are few businesses available to facilitate planning your trip, locating information or getting around. Maps and guidebooks are outdated and/or unavailable. All resources listed on this page are private parties who will do their best to help you. Please don't complain. Your visit is temporary and Georgians do not need to be reminded that their lives are very difficult. If possible, bring gifts for your new friends. In many small towns, children lack pens, pencils and books in English and German. The Georgian Academy of Sciences offers the opportunity to participate in the archaeological field school program in Vani from July 1, 2007 to September 1, 2007. Activities include training in field excavation techniques, hands-on excavation of fortress walls and temple structures from the 2nd and 1st Centuries BC, lectures related to the archaeological discoveries of the area and field trips to nearby museums, other archaeological excavation sites, and medieval monasteries and churches. All inquiries should be addressed to Darejan Kacharava, director of this program. The cost of the field school program, accommodations, food, guided tours and transportation is US$300 per week per person for a minimum stay of 14 days. The application deadline is June 1, 2007. Dima (Dee-ma) and Nino are personal guides who will help you to make all arrangements for your visit to Georgia. It is best to send a fax to let them know the services you will require. They will meet you at the airport or the bus station, find lodgings to suit your budget, arrange for private transportation where necessary and accompany you as a guide and/or translator as needed. They will also help you to plan an itinerary that accommodates your special interests: hiking through scenic meadows in the Meskhetian Mountains of southern Georgia, mountain climbing in the Caucasus Mountains, skiing in Gudauri, safaris to remote mountain areas to view bear, wild boar, lynx, ibex, chamois, wild goat, golden eagle, hawk and the griffon vulture, fishing in crystal clear mountain rivers and lakes, and visits to unique areas of Georgia such as Svaneti with their watch towers, the cave towns of Uplistsikhe and Vardzia, the numerous historical monuments of Kakheti, as well as castles, fortresses and ruins of archaeological interest that dot the Georgian landscape. Dima is a classical archaeologist and Nino's grandfather was a renowned Georgian historian. They speak German and English and are able to provide you with an in-depth perspective of Georgian history and culture. Georgia by Roger Rosen with photographs by Jeffrey Jay Foxx is published by Odyssey Publications. The 1999 edition is the most current guide to Georgia with very good information about its history, language, culture, architecture and unique areas. The Greeks in the Black Sea from the Bronze Age to the Early 20th Century is edited by Marianna Koromila and includes an article by Dr. Otar Lordkipanidze on the Colchis area of Georgia. An English version is available from The Panorama Cultural Society, 4 Alex. Soutsou Str, Athens, Greece. Tel. 30-1-362-3098. The Jason Voyage: The Quest for the Golden Fleece by Tim Severin, an Irish adventurer who wanted to prove that this legendary voyage was possible for a Bronze-Age vessel. It is a remarkable story of New Argonauts who rowed from Greece to Georgia for 1500 nautical miles in a reproduction 13th Century BC twenty-oar galley. Their journey ended when the new Argo settled on a sandbar in the Rioni River near Jaladidi in exactly the same spot where Jason's Argo had run aground! The Georgian Feast: The Vibrant Culture and Savory Food of the Republic of Georgia by Darra Goldstein vividly describes the richness of Georgian culture and their unforgettable tradition of hospitality. One has not truly visited Georgia until one sits at a Georgian feast table.